More than 20 years after introducing the Big Bertha driver – and setting the golf equipment on its collective ear – Callaway Golf Company is launching the next generation of Big Bertha driver along with Big Bertha Alpha. Each driver will be available beginning Feb. 14, 2014. Each Big Bertha model is aimed directly at rival TaylorMade’s SLDR driver franchise and backs up company President Chip Brewer’s commitment to technology that was lacking under his predecessor. Callaway calls Big Bertha a “Total Performance” driver that debuts its Adjustable Perimeter Weighting – an innovative sliding weight that can be moved around the perimeter of the driver head to help players produce longer, straighter drives. Adjustable Perimeter Weighting, according to Callaway, allows players to precisely locate an eight-gram sliding weight at any location on an approximately five-inch track to help optimize shot shape and control dispersion. Callaway says the placement of the APW along the perimeter of the head is critical in giving Big Bertha its high MOI (moment of inertia), which helps retain ball speed and accuracy on off-center impacts. The Big Bertha driver (suggested retail price $399) also features Hyper Speed Face technology that Callaway says helps deliver more ball speed; Advanced Adjustable Hosel that enables players to independently adjust loft and lie angle to help translate the added ball speed into more distance; and a Forged Composite crown made of high strength, lightweight composite material. This enable Callaway to offer multiple forms of adjustability while keeping the head weight under 200g and the swing weight at D2, which makes the Big Bertha driver extremely easy to swing. 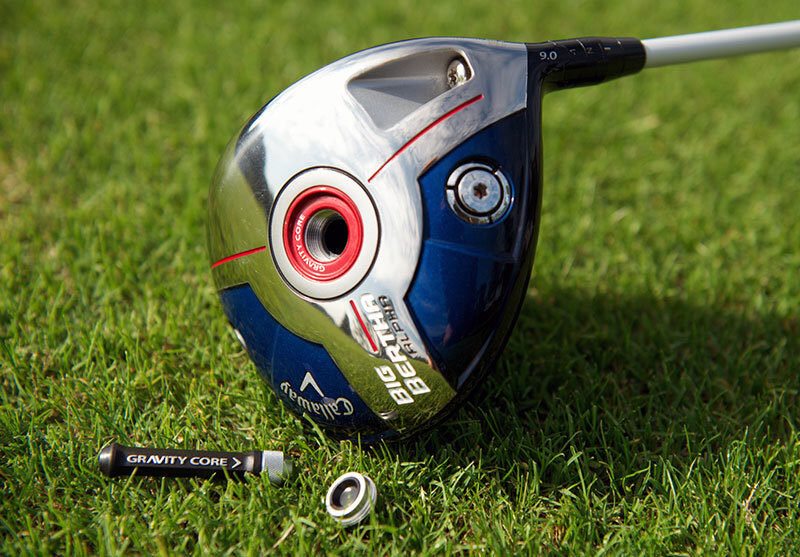 The key feature in the Big Bertha Alpha driver (SRP $499) is what Callaway calls “Gravity Core” that lets golfers adjust spin independently of launch angle – a natural extension to loft adjustability in a driver head. This adjustability, according to Callaway, breaks the fixed relationship between launch angle and backspin for the first time, providing a major asset in the fitting process to find optimal distance for a wide range of players’ abilities. The Gravity Core sits within the club head in a carbon tube that connects the crown and sole. It has a tungsten end, weighing 10.5 grams, and a glass fiber reinforced body – weighing 1.5 grams. The gravity core can be inserted into the club head two different ways, which Callaway says allows players to change the vertical center of gravity and alter the spin rates based on how it is positioned. When the tungsten end is closest to the sole, for example, it will create a lower center of gravity and lower backspin. When the tungsten end is inserted first and therefore closer to the crown, it creates more of a mid-CG (center of gravity) position. Generally, players with above average head speeds or those who are trying to prevent excessive spin will benefit from the lower center of gravity, which a creates a flatter, more penetrating trajectory accompanied by more roll out. For those looking for a more controlled and workable ball flight and less roll out, the mid CG position is recommended. According to Callaway, player testing has shown as much as a 600rpm spin differential between the two Gravity Core settings without a change in loft.